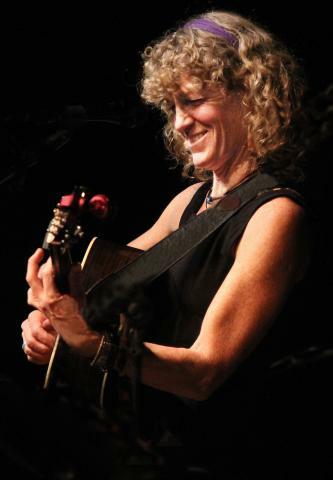 On Saturday May 11, Songwriters Cosy Sheridan and Julie Snow will share a show at Deb's Houseconcerts in Chesham NH. The show begins at 7, with a potluck at 6:00. For reservations, email Deb at pfmsconcerts@gmail.com. Julie and Cosy have been pals for many years, and have been each other’s sounding board for songs since 2001 when they met a songwriting camp. Julie officiated at Cosy’s wedding in 2014 and then Cosy officiated at Julie’s daughter’s wedding in 2017. Songwriter and guitarist Cosy Sheridan has been called one of the era’s finest and most thoughtful songwriters. Her song, My Fence & My Neighbor was #4 on the folk radio charts in 2018. Her concerts are full of energy and her songs are carefully crafted. “Cosy writes intelligent and clever lyrics with stickable melodies,” wrote Sing Out. 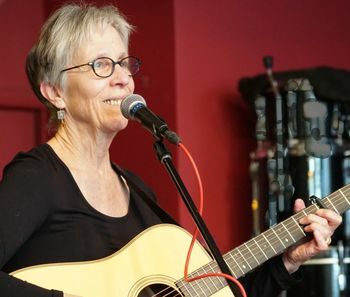 She first caught the attention of national folk audiences in 1992 when she won the songwriting contests at The Kerrville Folk Festival and the Telluride Bluegrass Festival. She has been on the road ever since, playing clubs, concert halls and coffeehouses across the country. Backed by the strong rhythms and harmonies of her bass player Charlie Koch, she plays a percussive bluesy guitar style - often in open tunings and occasionally with 2 or more capos on the guitar neck. Her concerts are a wide-ranging exploration of love songs for adults, practical philosophy and her signature parodies on women and aging. Her 2014 release, Pretty Bird, was chosen as one of the Top 100 CDs of 2014 by Sing Out Magazine. Julie will be opening the show accompanied by Charlie Koch on bass and harmonies.